Hawelka, one of 10 top places to eat in Cracow offers Polish-Galician cuisine with Viennese flavors in an elegant 19th century ambiance. Restaurant Hawelka: How old is really old? 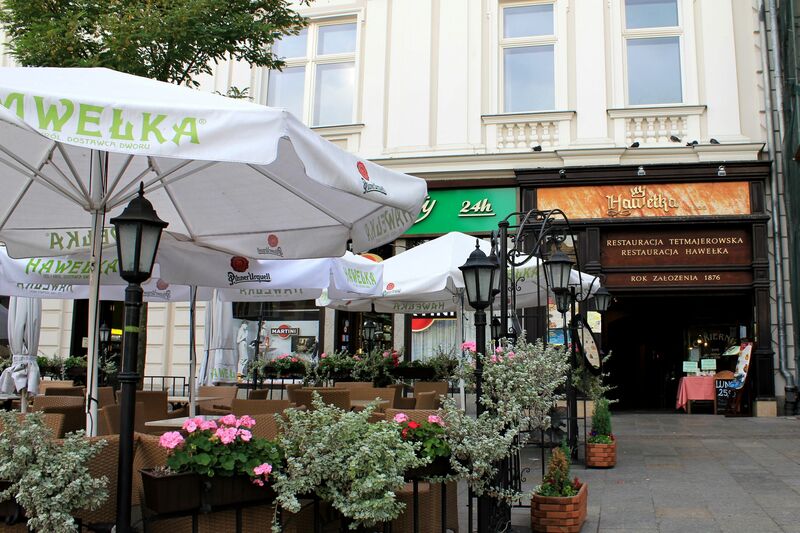 Restaurant Hawełka is usually considered as a younger sister of the legendary Wierzynek. In reality however it is other way around. Wierzynek draws its fame from the royal feast that took place in Krakow back in 1364, but the truth is that the restaurant was opened only in 1947. On the other hand the origins of Hawelka can be traced back to 1876 when a Polish merchant Antoni Hawełka opened the colonial shop “Pod Palmą” (“Under the Palm”). Soon after, in a move to expand his catering business he started-up what we will call today a “snack-bar” (at that time known as the “Breakfast Small Trade”). To get a right perspective let me mention what may be not so obvious these days - the modern restaurant industry is a relatively new invention on the map of the city. It took roots in the post-revolutionary France (end of the 18th century) where the newly created middle class embraced the trends of egalitarianism. Hawelka: View on the "Summer Garden" and building housing the restaurant. The idea that “anyone who could pay the price should get the same meal” was quickly capitalized by the market introducing individually prepared and portioned dishes to the public. As simple as that - one may say today, but even though we have been eating since the “beginning of time”, the idea of public restaurants, bars and cafes took really long time to materialize and become an indispensable part of the cityscape. Beautifully decorated Entrance Hall houses the shop with some Hawelka-made "goodies-for-foodies" and few little coffee tables along the wall. By all accounts Anthony Hawelka was one of the pioneers of this trend in Krakow. His “breakfast business” has been offering multi-layer sandwiches (just to let you know –well ahead of Big-Mac!). These “double-deckers” were prepared according to quite sophisticated and healthy recipes even by our standards. The fresh roll with butter was stacked with a piece of lobster in a mayonnaise sauce, slices of cucumber and hard-boiled egg and then topped with some caviar. Another recipe called for a stack of various cheeses mixed with layers of ham, sliced egg and caviar (it seems that caviar was adding a bit of “nobleness” possibly making it more attractive for upper-class clientele). It's still just the Entrance Hall, however you can already see the old European elegance and feel the climate of the 19th century Cracow. Undoubtedly Hawelka found a breading ground for this kind of services in Krakow. His catering business brought him fame and a prestigious title of the official purveyor to the Imperial Court in Vienna (at that time Krakow was part of the Austro-Hungarian Empire under Habsburgs rule). In 1909 Hawelka’s successor – Franciszek Macharski purchased the neighboring building opening there a modern restaurant, today known as the Restaurant Tetmajerowska. Since the beginning the restaurant became a preferred hangout for Krakow’s intellectuals and bohemia competing with another famous place - Jama Michalika (who else those years was spending time and (some) money in such places!). No wonder that room’s décor represents that very spirit hanging in the air at those times, influenced by the famed group of Krakow’s rebellious artists commonly known as the “Young Poland”. 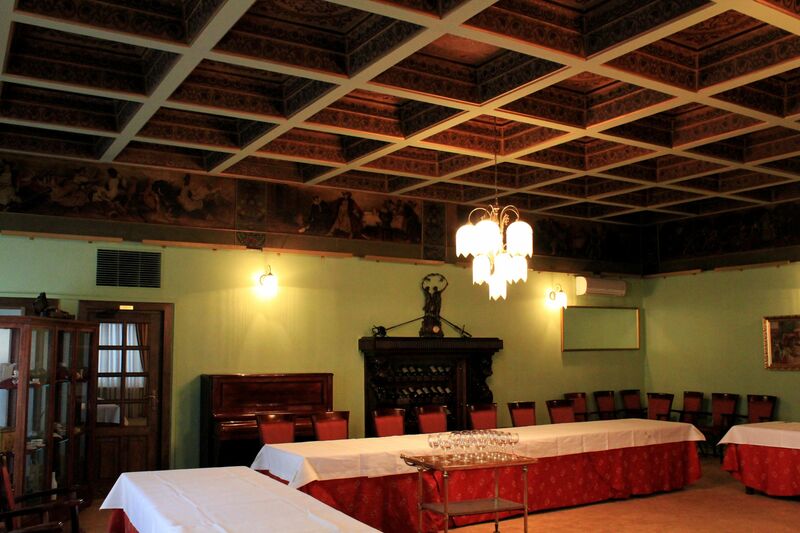 Plant ornamented wood-paneled ceilings, folks motifs mixed with decorative Art Nouveau, scenes reaching to countryside life and popular tales (beautiful wall painting presenting the story of the Master Twardowski) are work of Cracow’s painter Wlodzimierz Tetmajer. The bohemian ambiance is “nourished” by the decadent reddish colors…. Stained glass window at the entry to the ground-level room. 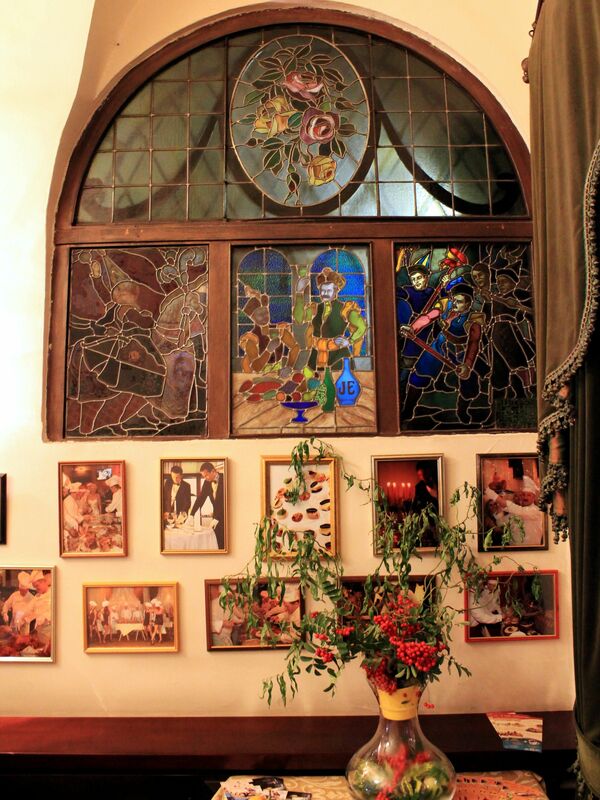 The ground-level entry hall is decorated by beautiful stained glass windows portraying Cracovians, famous Krakow’s Nativity (Szopka), feasts… . 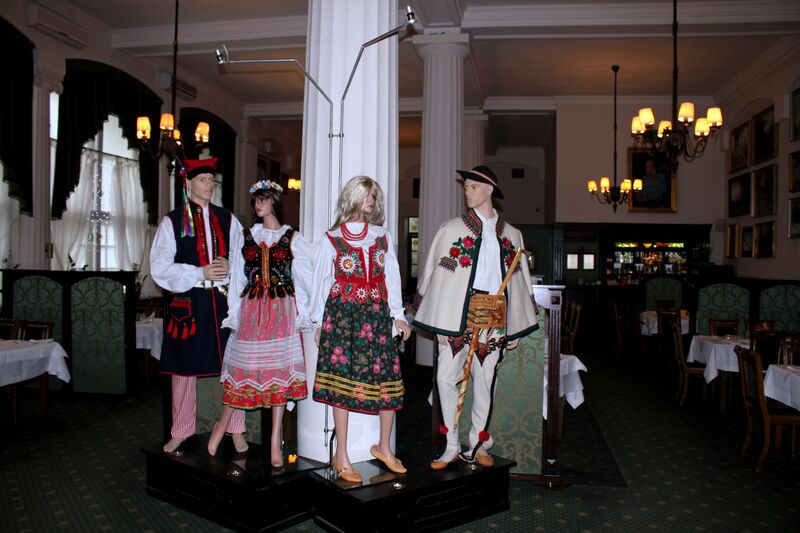 At the entry to the restaurant you are welcomed by life-size figures of Cracovians & Highlanders in their traditional folk-costumes. It seems to be a reminiscence of the namesake national opera composed by W. Boguslawski (“Krakowiacy i Górale” - staged for the first time in 1794). The interior of the ground-floor restaurant represents a different style and ambiance compared to the upper level one - Tetmajerowska. The portrait of the Emperor Franz Joseph and the reproduction of Jan Matejko’s “Prussian’s Tribute to the Polish King” adorning the walls are reminiscent of Polish’s complex past – the time of the fall and that of glory. The last one, due to its large size may be catching guests’ attention, but the overall ambiance in the room is rather determined by the abundance of other, smaller paintings decorating walls and overwhelmingly green and white interior (fashionable at the turn of the century). 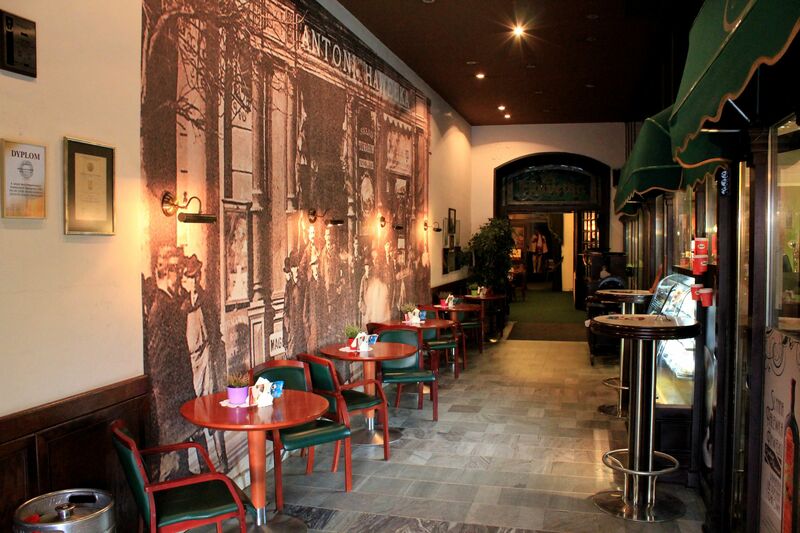 This décor preserves an old style European elegance and helps to keep restaurant’s more than century old climate. Tribute to W. Boguslawski - Cracovians & Highlanders in their traditional folk costumes. 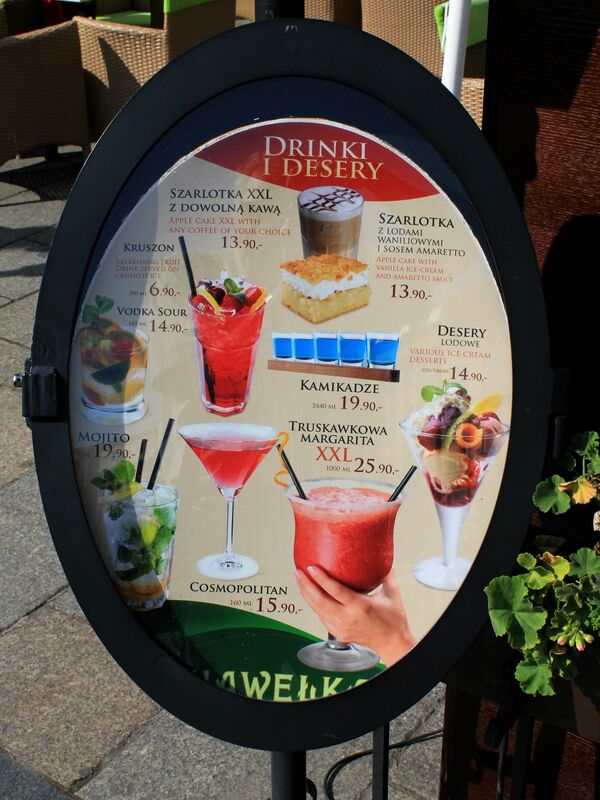 The menu represents some original recipes from Hawelka’s time. In general it is a mixture of traditional Polish- Galician cuisine with a visible twist of Viennese influence (and in larger sense a touch of Austro-Hungarian Empire). It may be worth to mention that the Viennese cuisine is a blend of flavors from the entire Empire (and beyond) including Italy, Germany, Hungary and Balkans. For example the well-recognized Wiener Schnitzel originated in 16th century Milan, it was just popularized in Viennese salons and then throughout the Empire. Back to the menu – suggested specialties include: wild-mushroom soup served in a crusty bread bowl, roasted, Cracovian-style duck in honey, Hungarian goulash with Viennese dumplings, pork tenderloins stuffed with blue cheese and spinach, grilled veal tenderloins with chanterelle mushrooms and fresh rosemary. Do not miss Polish dumplings in one of their endlessly long list of various stuffing & flavors (actually for beginners, the best may be to order the mix of traditional Polish dumplings giving you chance to “test your taste”…). Facing the famous Krakow’s Main Market Square is an opportunity not to miss for every restaurant. Not surprisingly all along the square there is an almost continuous chain of “street gardens” generously dotted with plants and flowers. They give a chance to guests to sit outside and soak-up in the atmosphere of the bustling and colorful old town at the same time enjoying flavors of the culinary delicacies….. Hawelka meticulously follows this trend with its spacious umbrellas-covered summer garden in front of the main restaurant. Following the old Hawelka’s catering tradition, the restaurant operates small shop offering confectionary and ready-to-cook food prepared according to generations old recipes, some remembering times of Hawelka’s Breakfast Small Trade. On the right - reproduction of the painting by J. Matejko, showing the "Tribute of the Prussia's ruler - Albrecht Hohenzollern to the Polish King Zygmund I the Old" (event that took place on the Krakow's Main Market Square in 1525). And the last accent of the Hawelka story – the settings. Well, each building bordering Krakow’s prestigious Main Market Square is part of the long history of this former capital city. Havelka is not an exception – the building housing the restaurant was formed by merging two (15th and 16th century) neighboring houses. It belonged to the rich and influential family of Polish prince Lubomirski. From the windows of this palace, the Polish king John III Sobieski watched celebrations held in his honor on the Market Square. Throughout the 18th century the palace was serving as headquarters for the Austro-Hungarian administration of Galicia. Later it came back into hands of Polish aristocracy. Unfortunately due to numerous modifications and reconstructions carried out by palace’s changing administrations and owners, it lost most of its architectural splendor. The decorative columns, portals and balconies vanished from the frontal façade. Fortunately, despite these “architectural injuries”, vibes from the long and rich history of this palace, the legends and true stories are mostly untouched by time (actually quite well alive) what makes Hawelka a great place to visit (on top of delicacies prepared in its kitchen). More good news – Krakow’s restaurant Hawelka has its younger sibling in Vienna. The coffeehouse opened by Anthony Hawelka’s relative – Leopold is located in the center of the city at Dorotheergrasse 6. 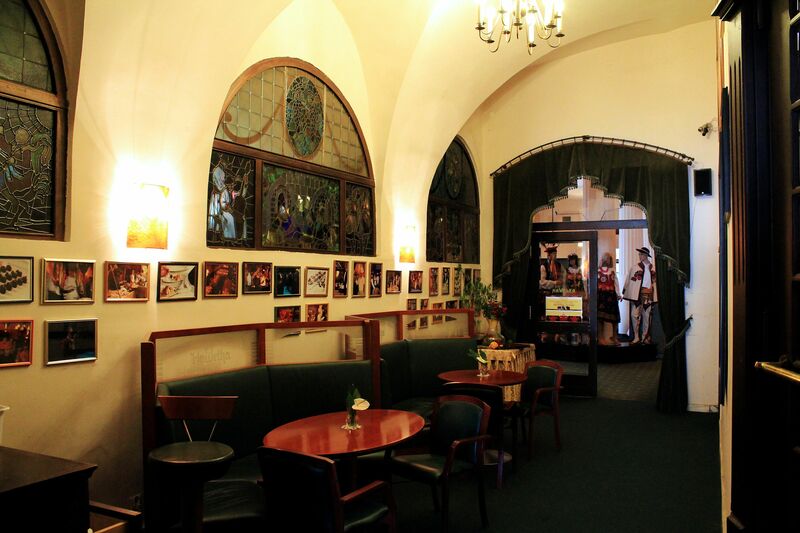 For long this place known as Art Nouveau Café Hawelka has been keeping similar traditions – being a popular gathering point for Viennese artists and writers. I'm sure that Hawelka will meet your expectations. However if at any time during your stay in Krakow you would like to try other restaurants, keep in mind that the list of Top Ten Restaurants in Krakow has at least nine more renowned candidates for fine dining in an old ambiance.